A must visit natural paradise near Famagusta in North Cyprus. This long, narrowing peninsula with beaches of golden sand, miles of undulating hills lost in isolation and wild donkeys remains one of the most unspoilt regions of the Mediterranean. Popularly called the panhandle of Cyprus, it was far more important and populous in the past than it is today and is littered with ancient sites. The Karpaz Peninsula National Park is a must visit. Driving to Karpas in a North Cyprus car hire is pleasure and best way to get there. Most visitors arrive in North Cyprus by air. The region has just one airport, Ercan International airport (pronounced Erjan) which is on the small side despite its grand name. Some online booking sites, including Turkish Airlines, refer to Ercan airport as Lefkosa. It is not internationally recognised as a legal port of entry except by Turkey. Consequently, international flights are required to put down in Turkey before proceeding to North Cyprus. This does cause some delay with some passengers leaving at the Turkish destination and others joining the flight to travel on to North Cyprus. Flights to North Cyprus are limited to a few scheduled airlines; there are no charter flights by major tour companies. Turkish Airlines is a regular operator with daily flights from a number of major cities in the UK and Europe via Istanbul. Here passengers change for the internal flight to Ercan. Atlas Jet and Pegasus too offer a good number of flights each week from London Stansted and London Gatwick with weekly flights from Manchester in the summer. There is no visa requirement for a 90 day stay for citizens of the EU and a good number of other countries including Australia, Canada, New Zealand and the United States. Visitors from some countries, like South Africa, do need a visa and will need to enquire with the North Cyprus Embassy representatives in their own country. Those who prefer not to have a North Cyprus stamp in their passports, and it is usually the majority, can fill in a simple visa slip and have that stamped and kept loosely in their passports. 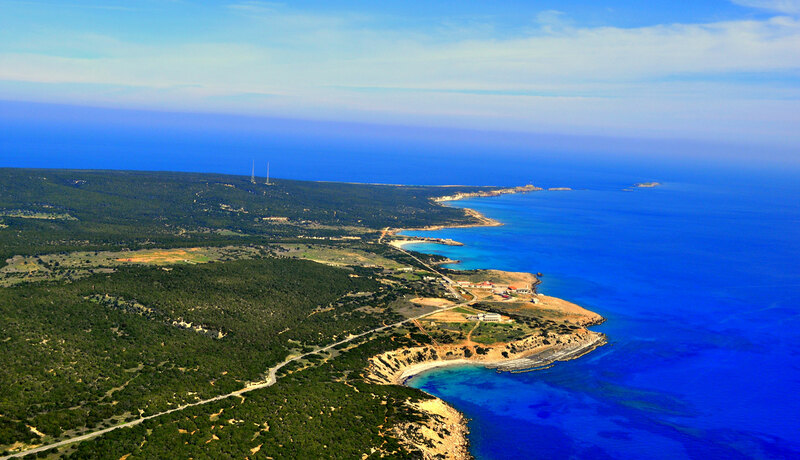 The airport is 23km east of Nicosia (Lefkosa), 50 km away from Famagusta and 44km from Kyrenia. Travelling to destination can present problems for the independent traveller. There is a limited shuttle bus to Ercan, Nicosia, Famagusta and other destinations. The time table can be checked online via Ercan airport web site. Hotels are aware of this difficulty and often offer a free transfer for guests or at least arrange a taxi transfer. Car hire companies too often offer free pick up and return. Now that the green line border crossing point from the south is nothing more than a passport control, it may be more convenient for visitors to use Larnaca airport. Larnaca can accept direct, non-stop flights which reduce the journey time a little and increases airline choice. There is a good fast road from Larnaca up to Nicosia so the journey time to Kyrenia is no more than 30 minutes longer than that from Ercan. Again, ensure your pick up is arranged either by the hotel or the car hire company and there is usually a charge for this airport transfer. Paphos airport is even further away, around a 3 hour journey by car. More of the low cost carriers fly into Paphos so securing a really cheap flight can tip the economics in favour of Paphos provided flight times are favourable. There are also a regular ferry services from Turkey to North Cyprus.